William Davison Jr. recently moved from Northern Nevada to the Denver, Colorado area to work in the aerospace industry after obtaining his electrical engineering degree from University of Nevada, Reno. He keep busy with his many hobbies (old BMW car restorations, LEGO Robotics and Halloween effects/costumes). He loves to restore, make and create. If he isn't doing something in the shop, then you can find him riding his 1956 BMW R50 motorcycle. Every year I have created at least one new Halloween baby doll for my collection. 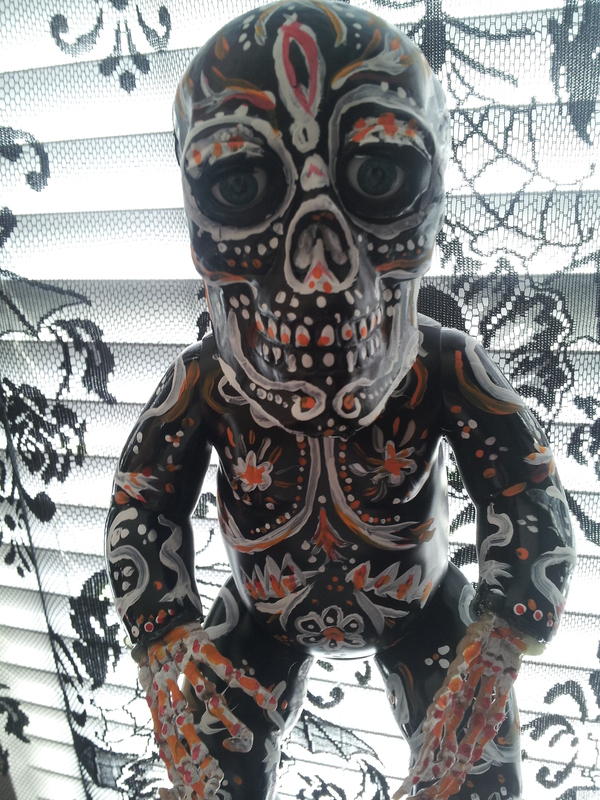 So, last year I did a Day of the Dead baby doll with eyes that roll back open when the doll is sat upright, a movable head, and its very own festive custom paint. I have done some pretty cool baby dolls for Halloween, but to me this one doll really is the coolest and, at the same time, the creepiest and most fun to create. I find my dolls at the local thrift stores taking care to find the ones with all plastic bodies, eyes that roll (and for my zombie doll a few years back, the tube that would allow me to make blood and green stuff come out of the mouth, depending on what I filled the squeezable holding bladder) and any other feature I might want to turn into a special effect. 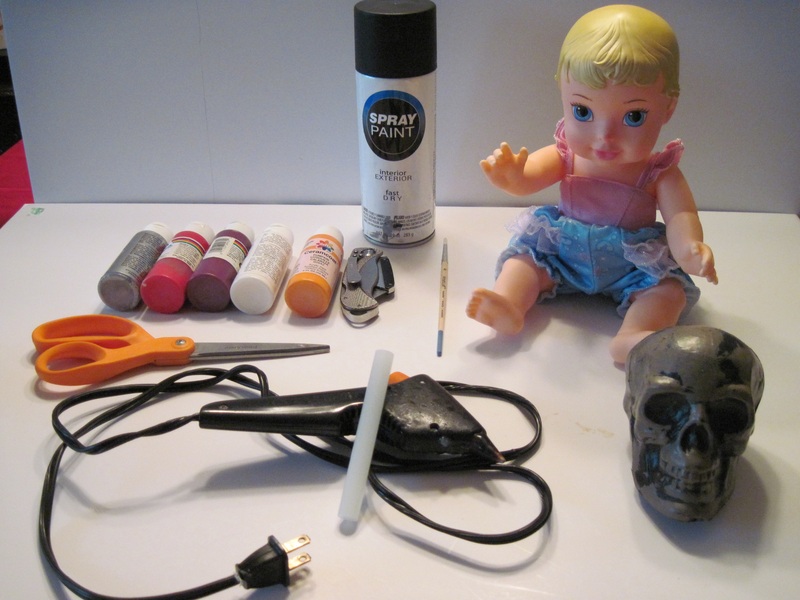 Sharp knife, hot glue gun, spray paint, acrylic paint, paint brush, scissors, CelluClay (a Papier-mâché-type product sold at craft stores), aluminum foil, fabric and a plastic baby doll. After taking the clothes off (and tossing them in the washing machine for re-use on other projects) and cleaning the plastic body of the doll with water and a few drop of bleach, I can guarantee that my doll is clean and ready for me to work on. Also it removes crayon marks, dirt, juice or anything else the doll was pulled through in its previous life. A clean canvas is key to the creative flow. A light sanding will also allow paint to stick better, so you might want to rough up the plastic body a bit. I typically pull the head off, cut out the eyes with a sharp razor, and start my transfer of the eyes back into the plastic skull. Cut a hole big enough for the rolley eyes and hot glue them into the skull. 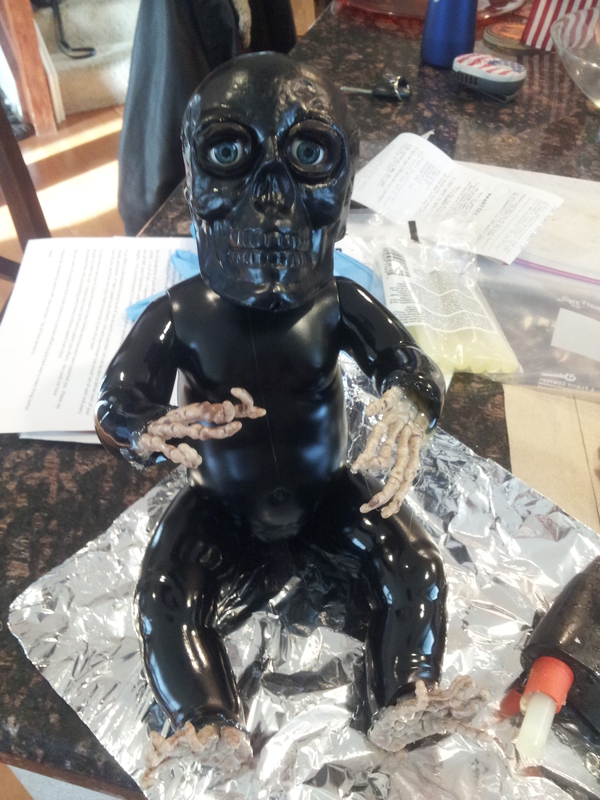 On this doll, I also cut the hands and feet off to allow plastic skeleton hands to be hot glued on in their place. Next is the paint! I use acrylic paint with a base coat of flat black spray paint. He is ready for the kiddies . . . Halloween . . . and to be on display for whomever comes during the month of October! I think the creepier the better. Have to keep those Trick-or-Treaters on their toes! As they get close, you can see their faces turn from ones of sugar-filled happiness to ones of horror and disgust! Check out all of our Halloween coverage here.